Sales tax is calculated at the Item Level, less any discounts and loyalty redemptions. For items subject to sales tax, tax is calculated on the selling price of each individual item and includes item-level and order-level discounts, and free item (Visits), dollar (Points), and event-based loyalty redemptions. For items subject to Secondary Sales Tax, Tax is calculated at the Item Level, less any discounts and loyalty redemptions. Secondary Tax is charged in addition to the Primary Sales Tax for each item. Log into your 1stPayPOS Portal. In the top menu, click Settings. Select Tax from the submenu. Click Add Tax Rate. 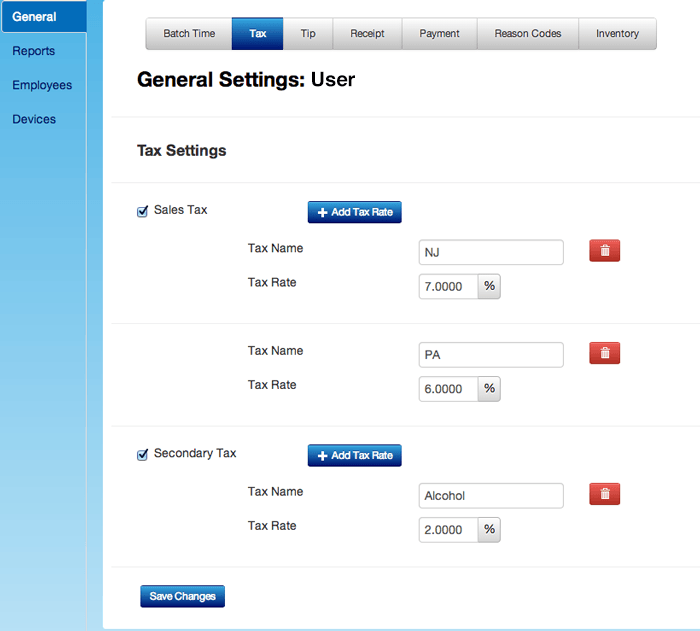 Two boxes will appear: Tax Name and Tax Rate. Enter the Tax Name, this is a required field. Enter the Tax Rate, which should be a percentage. For example, entering 7 in the box would apply a 7% tax rate. You may set up multiple sales taxes, and also secondary taxes. When completed, click Save Changes. To delete a tax rate, click the red trash can button next to the tax you'd like to delete.